As a quick response to the tsunami disaster that occurred in the Sunda Strait, the Center for Disaster Studies, the Institute for Research and Community Service, Bogor Agricultural University (LPPM IPB) in collaboration with the Department of Family and Consumer Sciences (IKK), Faculty of Human Ecology, Bogor Agricultural University (FEMA IPB) prepared a Trauma Healing Team for the victims. The team was prepared with trainings before leaving the field. As an initial step, the Department of IKK FEMA IPB prepared ten volunteers. The trauma healing volunteers consisted of alumni and students from the IKK Bachelor program and the Family Science Masters. The volunteer team's briefing was conducted for two days from 9-10 January 2019. The material provided included an introduction to trauma psychology and how to handle it, rapid assessment for disaster trauma, counseling and practice techniques, and trauma healing techniques. 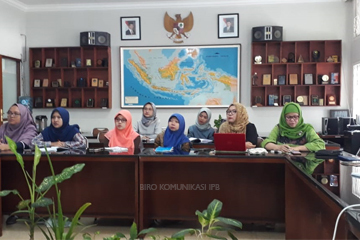 Briefing was delivered by the speakers who were also lecturers in the IKK Department, Dr. Melly Latifah, Dr. Dwi Hastuti, and Dr. Diah Krisnatuti. In addition, the volunteers are also equipped with the practice of trauma healing for children by playing, singing, folklore, drawing and telling stories from the IPB ISFA Character Education Labschool Team. Through this briefing, it is expected that the volunteers to have sufficient knowledge and positive attitude to be deployed to the disaster site.